Your favourite Earth pony from My Little Pony: Friendship is Magic has been mysteriously transformed into Pop! Vinyl form with the MLP Pinkie Pie Pop! Vinyl Figure! Standing 3 3/4-inches tall, the exuberant female pony looks true to form, and isn't that all you really need to know? 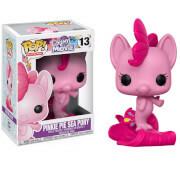 When you see just how cool the MLP Pinkie Pie Pop! Vinyl Figure looks you'll want to collect the rest in the My Little Pony line from Funko!